John Stanley married again, quite late in life, in the Christian Israelite Sanctuary on the 29th April 1845. His young wife, Mary Deane, was born in Northfleet in 1819, the daughter of James and Sarah Deane. Her father was a butcher by trade and seemingly had quite a large business on the banks of the river Thames. Courtesy of John Rowson I have the Deane family history dating back back to at least 1582. Northfleet used to be part of Gravesend, which was at one time the headquarters of John Wroe's Christian Israelite Society, until he found richer pickings at Ashton-under-Lyne. So it seems that there was quite a lot of communication between the societies. Another one of the chief elders of the Society met his wife at Gravesend, William Lees married Cordelia Clunne. Janes Deane's brother William also had a butcher's business in Gravesend and Mary's cousin, William Deane, had a publisher's business, which published 'The Life and Journal of John Wroe' in 1862. John and Mary had four children, their birthdates given to me by Lynne Gray from the Christian Israelite Church in Australia. Sarah was baptised in the Christian Israelite Sanctuary in 1846. By the time of the 1881 Census she is living with her two sisters in London at 16 Marlborough Place, St Marleybone, where her occupation is given as Artist in Painting. Her memorial inscription is to be found on the family tomb in St Peter's Churchyard, Ashton-under-Lyne. I know that in 1915 she was living at 26 Temple Gardens, Golder's Green, London. Elizabeth was also baptised in the Christian Israelite Sanctuary, and by 1881 is living with her sister Sarah in London, but no occupation is mentioned. Elizabeth's memorial is also on the family tomb in St Peter's Churchyard. Also baptised in the Christian Israelite Sanctuary. At the age of twenty four he is running a Turkish Towel Manufacturers in his father's old mill on Gas Street. Turkish towel manufacturing was a fairly recent innovation in the cotton trade. Please read Deane's cousin Robert Reschid Stanley's interest in all things Turkish on a later page. He is still running this business in 1888, but by now he has appointed Edward Saul to manage it for him. 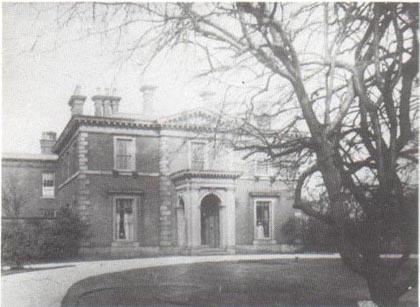 At the time of the 1881 Census he is living at 'Oaklands Hall' (picture below), Godley in Hyde with his wife Flora and infant children Flora Middleton aged six born in Flixton; Deane aged 3 and Monica Maria aged 2, both born in Marple and John Lewis a visiting journalist from Edgbaston in Birmingham. They also had three servants. Deane's occupation is given as a mining engineer, although he is still running Stanley Mills in Ashton. He died in Middleberg in the South African Transvaal Region from a fall from his horse in 1894. This area is now renamed Mpumalanga and is an area rich in coal mines. 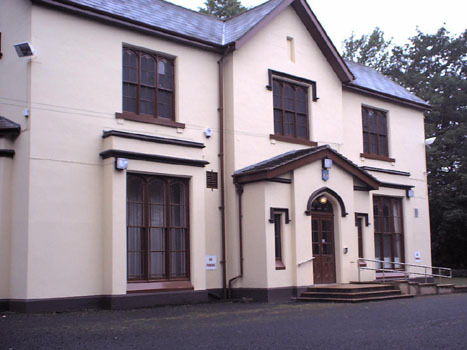 There is also a Heritage Centre called "Pilgrim's Rest", where a mining village has been restored as a Tourist Centre. This village grew out of a 'Gold Rush' in the 1870's. I have a letter written by Mary Stanley, which states that her son Deane came into too much money when he attained his majority, and although of good steady character, did not possess his father's head for business, so lost what his father had left him including his mother's annuity. Deane's memorial is also on the family tomb in St Peter's Churchyard, Ashton-under-Lyne. Also baptised in the Christian Israelite Sanctuary, by 1881 she too is living with her sisters in London, but by this time she is already a widow. In 1869 she married Eduard Wilhelm Guido Klaus in Manchester. Clara Isabella: born 14 August 1838, christened 14 October 1838. Throughout this period the family were living at 65 Wilhelm Strasse, Berlin. I am having some other bits of these christening entries translated and it would be wonderful if they give more information concerning his father's army career. 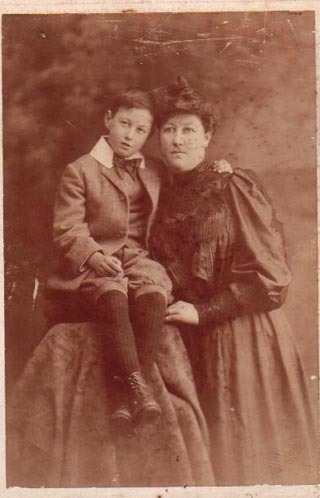 Sophia and Edward have a son Stanley Edward Reinhard Klaus born on the 13th September 1870. At the time of Stanley's birth, Sophie and Stanley were living at Firs Hall, Failsworth. At the time of the 1871 census Sophie is living with her mother and baby Stanley at Albert Villa, Victoria Park, Rusholme. At the time of the 1881 Census little Stanley aged ten was found to be attending Boarding School at Netherwood, Godalming, Surrey, his headmaster one Robert Sainsbury. Later Stanley went on to seek his fortune in Australia where he marries Catherine Amelia Persse Onge, the daughter of Robert Persse Onge and Ellen Cuttle on the 29th April 1899. Stanley's grandmother (Mary Deane) is delighted that they married on her own wedding anniversary. They in turn had a son Robert Deane Stanley Klaus born 26th August 1901. In 1910 we find Robert enlisted as a cabin boy on the ship "The Williamstown", captained by Charles Edward Young on a journey from Sydney to Melbourne. His surname Klaus is crossed out on the ship's manifest and Young is inserted. Meanwhile it seems that his Father Stanley, develops rather too much affinity with alchohol, and at some time his marriage to Catherine dissolves and he returns to England in 1914, only to die from Tuberculossis in January 1915 at Hastings. He is buried at Hastings but again has a memorial inscription on the family tomb in Ashton-under-Lyne. His wife Catherine and Captain Young tell their family that they have married at sea in 1912, although no marriage certificate has ever been found. I have recently received some nauralisation papers from the Public Record Office dated 1915 which help to give further background information to the above mystery. After Sophia married Eduard Klaus she went to live with him in Hamburg, but the marriage only lasted for about 4 months before she left him and came home to England, but by this time she was pregnant with little Stanley who was born in 1970. It is now revealed from these papers that Sophia was travelling to and from Australia between 1912 - 1914 to bring her dying son Stanley back to England. His death certificate shows that he had TB of two year's duration when he died in 1914. They both come to live at Hastings on the coast - possibly because she thought the sea air would do him good. After her son's death, Sophia is still living at Hastings when the first world war breaks out. Having only recently arrived in Hastings, the local Chief of Police makes out a report to Special Branch at New Scotland Yard and a joint Special Branch and Home Office investigation takes place as to her allegiance to this country. She is decribed as a German Alien Enemy and from then on has to get solicitors to act for her and to swear an oath of Allegiance to this Country and to become a naturalised British Citizen again. It must be remembered that her husband's father was an officer in the King of Prussia's Service rising to Colonel Grand Chamberlain. She had to get five people to affirm that they had known her very well and to stand surety for her. One was her sister Elizabeth, another was a George Lees, a retired banker, who had helped to administer her father's estate. Another was a Frederick Lindsay a retired merchant living on the Kings Road in Chelsea whose wife had gone to school with Sophia. Another was Sir William Garforth of Pontefract in Yorkshire who had known Sophia and her sisters for years. The last was Sir Owen Roberts who knew her because of the time she had been personal secretary to his wife. Sir Owen Roberts was the great grandfather of Sir Anthony Armstrong Jones, who married Princess Margaret. Another bit of news is that a friend of mine has written the autobiography of Prophet John Wroe. This is the religion that Sophia's father was involved in in Ashton-under-Lyne. Its coming out in hardback in June and is already available for pre-sale on Amazon. "Prophet John Wroe" Visions, Scandals and Virgins by Edward Green. There are still 6 Christian Israelites Churches in New South Wales and I think they are braced for some of the facts to be disclosed in this book. The BBC are also making a new filmed documentary about the battle for Britain's Soul and John Wroe will form a small feature within this programme. Dean Edward Young and I have been exchanging information over the last twelve months. He is in possession of a series of letters written by Sophia, her mother Mary and a couple by Stanley, which I now have copies of. These are rather illuminating and explain where all John Strongi'th'arm Stanley's money went. There are still Dean's in Australia down to the latest generation. Sophia Stanley's memorial inscription is also on the family tomb in Ashton. After her husband's death in 1855 Mary Stanley has all her four infant children re-baptised at Ashton St Michael's Church on 14th January 1857.